This baby blanket is not only very pretty in lace and texture, but it also looks great on both sides of the fabric! The pattern includes a simple edging for a boy, and a slightly prettier one for a girl. And you can increase/decrease this to any size you need from a cute little lovey to a full-sized afghan. Best of all, this is a fairly mindless crochet pattern, which makes it great for relaxing at the end of the day. And, I’m sure this would also look lovely if worked in pretty stripes. 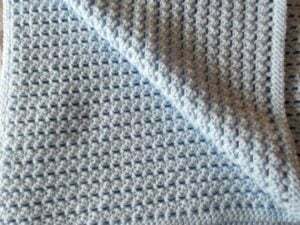 Here is another baby blanket crochet pattern that you might enjoy. Yarn: Bernat Baby Sport – Light #3 – 100% acrylic – 1 350 g/12.3oz ball. Ch 120, or any multiple of 2. Row 3: Ch 1, (hdc, ch 1) in first sc, *sk dc, (hdc, ch 1) in next sc; rep from * across. Note: Last ch-1 made counts as turning ch. Turn. Rows 4-95: Rep rows 2 and 3. Rnd 1: Ch 1, sc evenly around, working 3 sc in each corner; join with sl st in first sc. Rnd 2: Ch 1, sc in each st around, working 3 sc in each corner; join with sl st in first sc. Fasten Off. Rnd 1: Rep Rnd 1 making sure to end with an even number of sts. Rnd 2: Ch 1, (sc, ch 2, dc) in same st as join; *sk next st, (sc, ch 2, dc) in next st; rep from * around; join with sl st in first sc. Fasten Off. 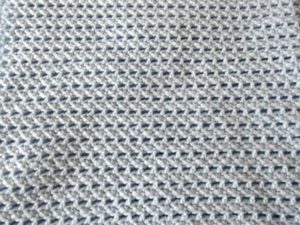 And if you enjoyed this, you might also enjoy a visit to CPB for more free crochet patterns for Baby Blankets. i am Singaporean and my hobby is crochet. I use to see your post in Pinterest and interest to have free pattern online. 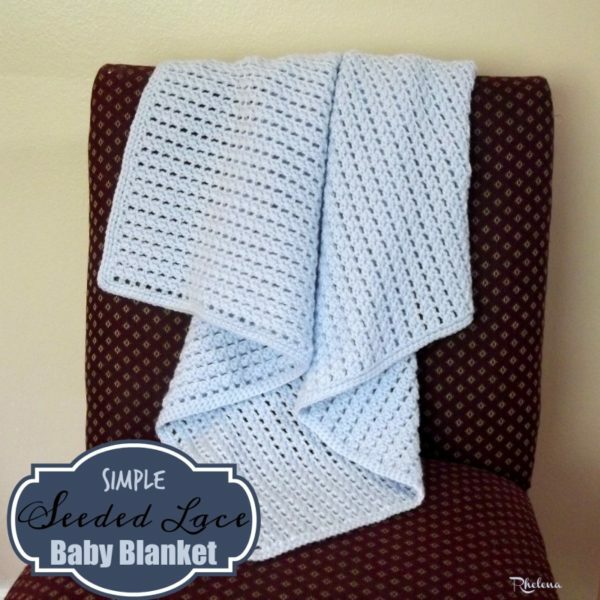 I want to make the Simple Seeded Lace Baby Blanket in an afghan/throw size for an adult for their living room. What changes are needed to increase the width when I start? Thanks so much for any help with this. It’s absolutely beautiful and I would love to make it in different sizes. You can chain any multiple of two to get the width that you need. Is this blanket in US terminology ?